I received an email with this question and I thought I’d address it here in a blog post. To start art and music in high school years would be hard if that interest is not there. Young ones are more malleable. That’s why laying the foundation of a love of fine arts is so important. But I don’t think it’s too late. I’d hate to force it, but maybe some intentional exposure would pique some interest. For example, have Bach or Mozart playing each day in the background, or lay art prints around on the coffee table. Try to entice him to bite the bait. When he does, you’ll be ready with some spontaneous art or music lessons. But then again, a narration of a painting is really quick. It takes just minutes. Capitalize on the student’s interests to draw him in. This particular child loves animals, so I suggested that the mom choose an artist who painted a lot of animals. I think that requiring two minutes of focused study on a painting and then two more minutes of verbal narration would not be torture for any child as long as the painting was interesting to him. Look at this list of subject matter, and find an area that would be engaging — animals, children, flowers, history, etc. Take a field trip to a museum or go to a concert. Use an art calendar as a way to sneak in more art. What do YOU suggest for introducing a reluctant student to art and music? I agree that it’s never too late to develop an interest in art or music. I too like a “gentle” approach to art ~ going to art museums, lots of art books around the home, and simply talking about art has worked for us. I always like to have a plan before going to an art museum so that we don’t feel like we have to look at everything, but rather see and study the works we really want to see. .-= Julie´s last blog ..A Time for Tea and a Pause =-. Indeed, with young kids it is easy to expose them to art & music. For high-schoolers I would use good biographies of artists and composers. Or hilarious ones, like ‘Why did Beethoven threw the stew?’ There are lots of really good books on composers, poets and artists that can provoke a deep interest in their personality and work. Don’t forget the DVD’s in the series of ‘Beethoven lives upstairs’ and ‘Bach’s fight for freedom’. My high-school is a long time ago, but I always enjoy these short movies. For a high-schooler I also would start with Modern Art, or Picasso instead of Raphael or Botticelli. I agree that finding a suitable subject matter can spur interest! While I researched Picasso’s works, my high schooler made several comments and had quite a few opinions of his “weird paintings”. This was a good oportunity to discuss art forms and modern art. Many movies use classic music and opera. I used a Cinema Classic CD to expose them to new classic music they may have heard during a movie. Introducing art and music is like learning to like new and different food – encourage just a taste, then a sample, then a starter before dishing up a whole meal! .-= Nadene´s last blog ..One-Page Minibook Templates =-. Picture study and music appreciation don’t need to be complicated or lengthy to make an impression. I think the other comments have had really good suggestions. The only one I would add is the element of allowing the child in high school to pick the artist studied or a particular style. Once they reach the rhetoric stage of thinking, they like a little more freedom to explore and make the study their own. “Do you want to study Picasso or Van Gogh?” “Would you like to learn more about abstract or cubist art?” I am actually in this process right now with my 14 and 16 year olds and it is very interesting to see what they are choosing for next year. Other than that, short and sweet is the name of the game around here. .-= Barb-Harmony Art Mom´s last blog ..A Rare Negative Review: TruthQuest =-. Excellent post and excellent suggestions in the comments! Great post, as usual! I’m still new in the blogosphere, but I’ve really enjoyed reading you lately! 1) Buy art books, with large, color prints (please, not black and white) and leave them lying open on your nightstand, your coffee table, your passenger seat of the car, etc. I find a great work of art will often provide its own allure and your targeted student will pick up the artbook on his own accord. 2) Regularly download artwork as your computer screen saver. 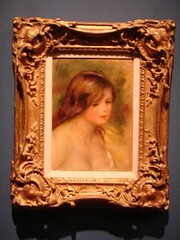 You can most famous art at commons.wikimedia.org or try http://www.wga.hu/. 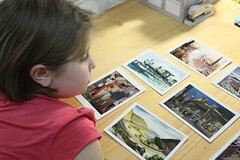 3) For students who enjoy learning by exploring online, I recommend http://www.artcyclopedia.com/museums.html. At this site, you pick a region of the world, then pick a museum of that area, then take a virtual tour. It’s pretty cool. Oh my gosh, sorry I wrote so much. Clearly this means a lot to me! Thanks again for your post. You do a great job! Hmmm…is there a time period the child is interested in? If so, add in music and art of that time period. Don’t be afraid to explore modern art and music and then work your way backwards as interest gains. I also think field trips are great for teaching these subjects. Go to a museum or to a concert or symphony. Oops – made a mistake in my previous comment. Rossini wrote “The Barber of Seville.” It was Mozart who wrote “The Marriage of Figaro.” I guess this is good practice for learning to laugh at myself (hee hee). .-= Tatiana´s last blog ..Video Games =-. My son is reluctant as well and he is only 6 years old. We hit upon an idea in January to do a CSI (Crime Scene Investigation) style picture study, but I didn’t mention a crime =). We used a book light and a magnifying glass. Focusing on small sections of a painting from a large book is really interesting. We found writing on the wall and could see other details more clearly. This really piqued his interest. I wrote about in on my blog, it’s called CSI Picture Study. .-= Cori´s last blog ..Outdoor Challenge Day 3 and 4 =-. @Cori — Yes! I remember this post! I have it bookmarked. Here is evidence! I love this idea. Art sleuths, using a tool to make learning fun. Brilliant. My idea/comment is similar to richele’s–in regards to time period. It could be very natural to add art to the study of history. I fell in love with art because of a history teacher. History came sooo alive as we saw how it influenced the attitudes and opinions of society and how this was reflected in the art of that time. So, what started off as history through art quickly became a love of art history and art itself. .-= amanda wu´s last blog ..seventeen years ago =-. This is a fabulous post! Thanks for all the great ideas. We’ve incorporated music in our everyday life with regular selections being played in the car, or our local Classic radio station on from 5-7pm weekday evenings. I’ve also done a focus on a composer per month, then we switched to a country focus per month. (I’m still researching April/May’s focus). Art is our trickier subject of the two. I have Mariposa who loves art, and Maestro who can take it or leave it. I’m happy to say the curriculum we’re using now allows some investigation into arts by way of selecting a ‘Choose your own adventure’ project. It’s very much as others have commented: incorporating art studies in with the history. He’s chosen a few art projects, but I do really need to extend this a bit more .. I can see the potential for further exploration. We also don’t want to neglect our nature journals.